Josh Wallace, Emmett High, .067, 13.85 (13.84 dial) 93.55 def. Adam Wurtz, Meridian High, .120, 14.74 (14.68 dial) 90.00. Semi-Jeff Fetty, Middleton High; Jacob Brown, Idaho Falls High. Quarter-Sabra Rasmussen, Renaissance High; Matt Burger, Borah High; Nick Figura, Borah. Hayden Quilter, Renaissance High, .051, 18.27 (17.98 dial) 73.68 def. Zach Pettis, Middleton High, .222, 18.55 (18.30 dial) 71.94. Semi-Nick Phillips, Weiser High; Westin Bradberg, Middleton High. Quarter- Dustin Smith, Middleton High; Courtney Horine, Middleton High; Cory Bailey, Middleton High. Joe Witherspoon. .041, 13.82 (13.83 dial) 96.96 def. Mike Ritz, .122, 13.03 (13.10 dial) 100.63. Quarter-Chris Bidondo; Gary Allen; Carl Youngstrom. Steve Nebeker, .036, 15.08 (15.07 dial) 90.50 def. Troy McDonald, .072, 14.54 (14.58 dial) 94.17. Quarter-David White; Austin Brown; Harry Packwood. Dave Allen, .084, 9.68 (9.60 dial) 132.66 def. Liz Micheletty, .130, 10.14 (10.08 dial) 137.67. Quarter-Brian Batten; Tish Powell; Mike Smith. Mike Ritz, .159, 13.07 (13.00 dial) 107.14 def. Derryl Winters, .070, 13.41 (13.50 dial) 94.08. Quarter-Catherine Seamons; Denise Clark; Ron Wurtz. Jim Coryat, .117, 10.98 (10.97 dial) 122.08 def. Ryan Resinkin, .120, 11.64 (11.59 dial) 112.52. Zak Pedraza, .250, 14.61 (14.71 dial) 95.36 def. Mike Dome, -.053 foul, 14.37 (14.37 dial) 95.36. Glen Phillips, .121, 12.41 (12.50 dial) 110.29 def. Zak Pedraza, -.014 foul, 14.68 (14.99 dial) 95.69. Quarter-Ed Scott; Casey Nicolosi; Alexander Orocco. 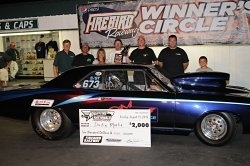 After twice finishing runner-up at Firebird, John Hale put together an impressive set of runs to win the Pepsi Nightfire Nationals. In the first three rounds of eliminations, the Texan ran 5.90, 5.90, and 5.91 to beat Wally Giavia and Dennis LaCharite before earning the odd-lot semi-final bye. 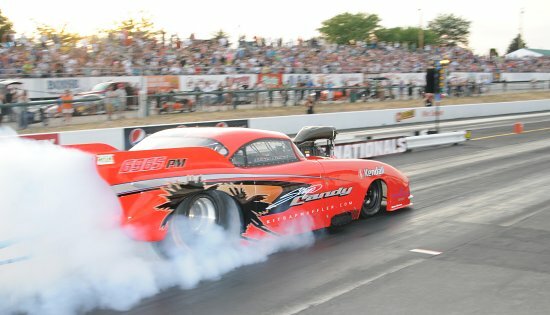 In the final, the Guy Tipton-tuned Camaro flew to the second quickest run by a Funny Car in Firebird history tearing off a sensational 5.77-248.20. Opponent and newly crowned Boise-Bakersfield Blitz champion Dan Horan claimed runner-up at 5.94-231.66. 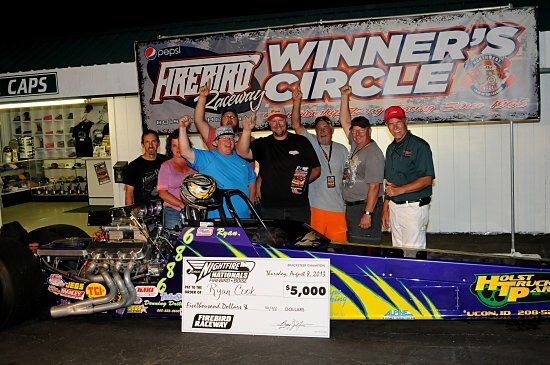 In Top Fuel, Brett Harris returned to the seat of Colorado team owner Steve Harwood’s “Nitro-Hemi” dragster to earn his fourth Nightfire title. Harris qualified on the pole at 5.80 and charged through three rounds of the seven-car field to beat a broken Jim Murphy who had run 5.73-258.17 in an engine damaging semi-final heat with Adam Sorokin. 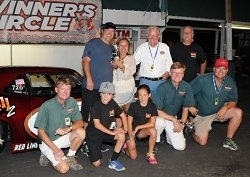 Eleven Outlaw Pro Modified Doorslammers rolled into Firebird to battle for an elite 8-car show. 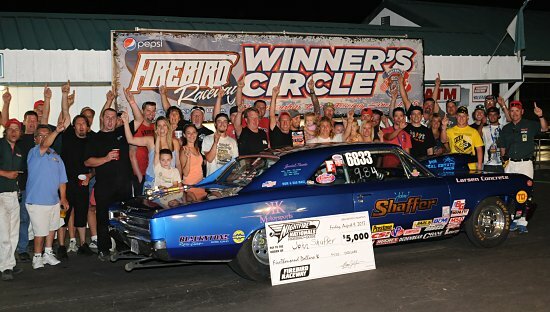 Marc Meadors was not to be denied yet a second Firebird victory and third straight West Coast crown. The president of the Goodguys organization ran 6.03 to claim the pole and followed up with a 6.09 (over Craig Cawte); 6.05 (over T.K. Krupa) and a final round 6.03-242.65 (low e.t. of the meet) to upend last year’s winner Dan Myers in a rematch of the 2012 event. 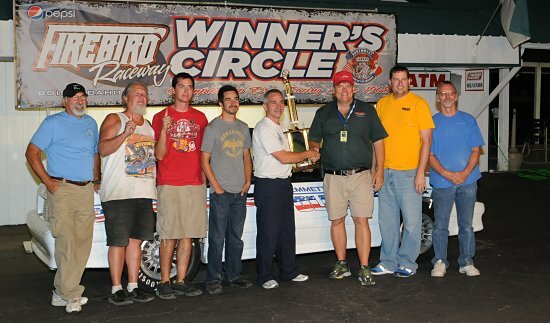 The National Dragster Challenge 4-Night Bracketeer Point’s Champions were awarded to: Bracketeer Champ-John Shaffer, Pro-Dustin Martin, Heavy-Karl Martin and Sled/Bike-Craig Jensen. John Hale, Addison, Texas, .133, 5.77, 248.20 def. Dan Horan, Sylmar, Calif., .132, 5.94, 231.66. Brett Harris, Hooper, Utah, .315, 6.99, 132.95 def. Jim Murphy, Santa Rosa, Calif., broke. Marc Meadors, Danville, Calif., .059, 6.03, 242.65 def. Dan Myers, Ramona, Calif., .029, 8.13, 115.41. Blu Hayball, Fort Hall, Ida., .002, 7.45 (7.48 dial) def. Chuck Hawk, Jr., Tuscon, Ariz., .019, 7.86 (7.89 dial) 168.47. Semi-Jason Thomas, Meridian; Jamie Toews, Dawson Creek, British Columbia. Quarters-Trevor Harkema, Hayden, Ida. ; Ed Franek, Payette; John Shaffer, Boise. Eighth-Mark Kidd, Twin Falls; Troy Pecht, Caldwell; Ken Nelson, Hayden, Ida. ; Jim Climer, Kimberly; Mike Nicholson, Vancouver, Wash.; Bruce Williams, Chandler, Ariz.
Dustin Martin, Federal Way, Wash., .035, 10.12 (10.13 dial) def. Mark Kidd, Twin Falls, .075, 9.43 (9.47 dial) 133.13. Quarters-Jeff Taylor, Forest Grove, Ore.; Tom Bittick, Caldwell. Eighth-Dustin Ward, Renton, Wash.; Steve Pyburn, Nampa; Ken Frickey, Nampa; Melissa Jarboe, New Plymouth. Lucas Hull, Middleton, .061, 12.44 (12.53 dial), 108.19 def. Karl Martin, Riverton, Utah, .083, 11.57 (11.67 dial) 116.27. Quarters-Bill Meyers, Nampa; Kristi Shawver, Meridian; Richard Rush, Boise. Quarters-Chase Bittick, Middleton; Jacob Wood, Meridian. Kacee Jo Bootsma-Morris, Outlook, Wash., .028, 7.44 (7.38 dial) 169.97 def. Jake Neibauer, Billings, Mont., .042, 7.52 (7.53 dial) 175.81. Semi-Dan Lafferty, Wendell; Jamie Toews, Dawson Creek, B.C. Quarters-Tom Koenen, North Bend, Ore.; Tom Franks, Boise. Dan Lafferty, Wendell, Ida., .026, 7.09 (7.09 dial) 182.00 def. Chris Jaggers, Middleton, .033, 8.27 (8.28 dial), 157.06. Semi-Derek Rose, St. Albert, Alberta; Donny Toia ; Tuscon, Ariz.
Quarters-Ed Cutler, Meridian; Camille Shaffer, Meridian; Mike Goad, Anacortes, Wash.; Rayce Kidd, Twin Falls. David Chun, Jr., Vancouver, Wash., .079, 8.58 (8.54 dial), 155.57 def. Chad Campbell, Meridian, .090, 10.39 (10.40 dial), 120.44. Semi-Chris McCallum, Grand Junction, Colo.
Quarters-Doug Wickfors, Eagle; Matt Compton, Boise. 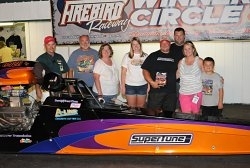 Win – Jason Rupert, .131, 5.89, 244.83. Cameron Ferre, .112, 6.49, 179.35. Win – Tim Boychuk, .116, 6.15, 233.70. Win – Dan Horan, .172, 5.90, 247.25. Scott Stanger, .162, 6.51, 217.91. Win – John Hale, 5.90, 239.23. Wally Giavia, .147, 6.07, 208.42. Win – Robert Overholser, 5.98, 233.52. Win – Dennis LaCharite, .109, 6.12, 228.25. Kris Krabill, .127, 6.13, 232.67. Temp: 89 degrees; Track Temp: 125 degrees, corrected altitude: 5,400’. Win-Tim TK Krupa, 6.179, 232.25. Win-Dan Meyers, .037, 6.450, 233.94. Rod Burbage, .064, 7.586, 147.97. 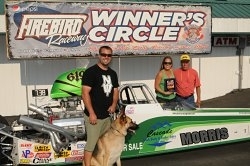 Win-Marc Meadows, .010, 6.057, 242.06. Tim TK Krupa, .005, 7.109, 154.87. Win-Dan Horan, .010, 5.904, 245.36. Jason Rupert, .112, 5.894, 244.89. Win-John Hale, .114, 5.916, 237.90. Win-Brett Harris, .095, 5.884, 245.29. Rick White, .134, 6.589, 219.40. Win-Jim Murphy, .132, 5.739, 258.17. Adam Sorokin, .053, 6.838, 144.27. 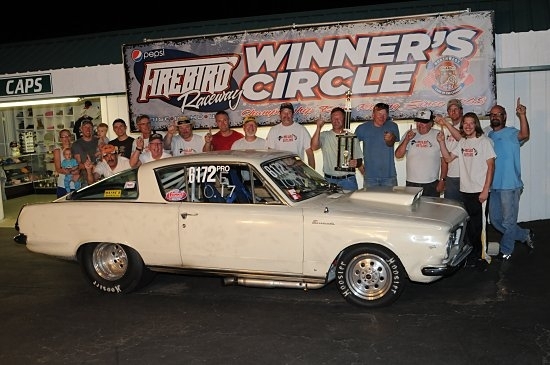 Texan John Hale recaptured the top spot in qualifying from World Champion Jason Rupert at the 42nd Annual Pepsi Nightfire Nationals at Firebird Raceway. During the final Funny Car session, Rupert charged to the #1 position in qualifying at 5.87-242.52 in the second to last pairing. Not to be denied, Hale delivered the event’s top run, ripping off a superb 5.84-241.22. 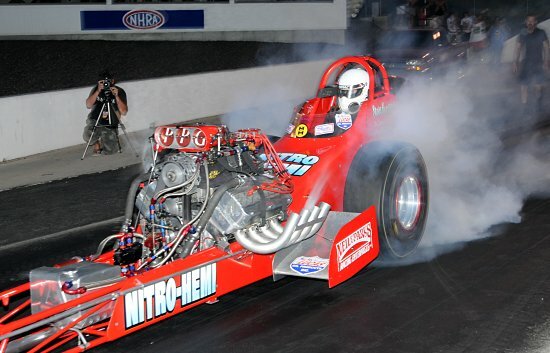 In Top Fuel qualifying, former NHRA national champion Brett Harris, Hooper, Utah, surprised the big audience with an outstanding 5.80-247.38 at the wheel of the Steve Harwood-owned “Nitro Hemi” Dragster. Leading all Pro Modified qualifiers is Marc Meadors, Danville, Calif., laying down a very strong 6.03-241.41 (and fourth quickest Pro Mod pass in track history) during the third and final session. 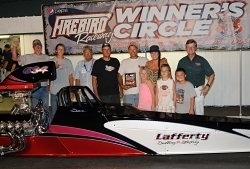 Gates open Sunday at 8 am followed by sportsman time trials at 9 am. Final professional eliminations starts at 2 pm. Tickets are on sale at the raceway, which is located 5 miles north of Hwy 44 on Hwy 16 about 10 minutes northwest of Eagle. 2. Jason Rupert, Yorba Linda, Calif, 5.87, 242.52. 3. Dan Horan, Sylmar, Calif., 5.89, 248.82. 4. Tim Boychuk, Edmonton, Alberta, 5.99, 238.72. 6. Kris Krabill, Tacoma, Wash., 6.05, 238.41. 7. Dennis La Charite, Torrance, Calif., 6.17, 230.35. 8. Mark Sanders, Maple Valley, Wash., 6.19, 232.85. 9. Chris Davis, Spokane, Wash., 6.43, 196.16. 10. Scott Stanger, West Point, Utah, 6.53, 219.94. 11. Cameron Ferre, Huntington Beach, Calif., 6.61, 205.80. 12. Wally Giavia, Klamath Falls, Ore., 7.02, 141.02. 1. Brett Harris, Hooper, Utah, 5.80, 247.38. 2. Adam Sorokin, La Crescenta, Calif., 5.83, 224.83. 3. Jim Murphy, Santa Rosa, Calif., 5.84, 237.52. 4. Rick White, San Diego, Calif., 5.85, 248.00. 5. Tony Bartone, Long Island City, New York, 5.93, 218.92. 6. Brendan Murry, San Jose, Calif., 6.36, 230.35. 7. Ron August, Pleasanton, Calif., 6.39, 212.91. 1. Marc Meadors, Danville, Calif., 6.03, 241.41. 2. Dan Myers, Ramona, Calif., 6.09, 211.51. 3. Rod Burbage, Anderson, Calif., 6.12, 236.53. 4. Mike Gondziola, Saskatoon, Sask., 6.18, 232.79. 5. Tim “TK” Krupa, Valencia, Calif., 6.19, 231.83. 6. John Scialpi, Phelan, Calif., 6.39, 222.44. 7. Jeremy Hanger, Fullerton, Calif., 6.43, 217.44. 8. Craig Cawte, Cranbook, British Columbia, 6.53, 189.03. 1st Alt. Mike Weiss, Port Orchard, Wash., 6.65, 209.15. 3rd Alt. Yvonne Lucas, Maple Valley, Wash., 11.33, 76.16. Bud Preuss, Grand Junction, Colo., .037, 7.96 (7.92 dial) 164.02 def. Stan Leerkamp, Olympia, Wash., .044, 7.54 (7.49 dial) 179.03. Semi-John Shaffer, Boise; Jake Neibauer, Billings, Mont. Quarters-Mike Nicholson, Vancouver, Wash., Rayce Kidd, Twin Falls; Chris Jaggers, Middleton. Eighth-Matt Schoenfeld, Magna, Utah; Ken Nelson, Hayden, Ida. ; Tom Koenen, North Bend, Ore.; Arron Spitzer, Arlington, Wash.; Sean Shaffer, Boise; Tom Avgerakis, Newberg, Ore.; Tom Malicki, Brush Prairie, Wash.
Randy Williamson, Boise, .030, 9.44 (9.43 dial) def. Dustin Martin, .030, 10.138 (10.14 dial) 131.64. Semi-Michael McCallum, Grand Junction, Colo.
Quarters-David Deming, Nampa; Steve Pyburn, Nampa; Gary Hall, Brigham City, Utah. Eighth-Larry Pittenger, Williams, Ariz.; Dustin Ward, Renton, Wash.; Dennis Jorgenson, Nampa; Bruce Stewart, Middleton; Joe Witherspoon, Jerome. Karl Martin, Riverton, Utah, .013, 11.80 (11.73 dial) 104.23 def. Lonnie Jesser, Meridian, .134, 11.57 (11.58 dial) 111.70. Quarters-Ron Wurtz, Caldwell; Travis Bowins, Meridian; Tom Davis, Meridian. Craig Jensen, Chubbuck, Ida., .084, 9.76 (9.73 dial) 125.24 def. Rich Pedraza, Jr., .011, 10.16 (10.05 dial) 120.33. Quarters-Scott Grondahl, Nampa; Zak Pedraza, Boise. Andy Morris, Olympia, Wash., .024, 7.69 (7.76 dial) 1601.11 def. David Myhre, Sheridan, Calif., .035, 7.89 (7.84 dial) 150.47. Quarters-Diana Anderson, Twin Falls; Bob Seamons, Ogden, Utah. Paul Nicolosi, Nampa, .030, 10.86 (10.85 dial) 120.53 def. Steve Kelly, Vancouver, Wash., .056, 10.93 (10.88 dial) 111.28. Semi-Cody Clark, Pocatello; Keith Blackwood, Boise. Quarters-Jim Coryat, Nampa; Brent Borchers, Meridian; AJ Armstrong, Star; Phil Sielaff, Pine, Ida. Pro DashTom Bittick, Caldwell, .047, 11.50 (11.50 dial) 115.96 def. Lisa Thomas, Meridian, -.028, 9.88 (9.91 dial) 132.82. Semi-Larry Lamberson, Boise; Nicholas Shepherd, Tigard, Ore.
Bracketeer DashMark Kidd, Twin Falls, .016, 7.60 (7.62 dial) 165.19 def. Bob Seamons, Ogden, Utah, .015, 8.20 (8.22 dial) 156.52. Semi-Mike Nicholson, Vancouver, Wash.; Chuck Hawk Jr., Tucson, Ariz.
John Hale from Addison, Texas, charged to the top spot in Funny Car qualifying at the 42nd Annual Pepsi Nightfire Nationals. Hale tore off a 5.89 elapsed time at 236.22 miles per hour. He leads Dan Horan, Sylmar, Calif., who is second at 5.90-246.84 at Firebird Raceway. In AA/Fuel Dragster, reigning NHRA Heritage World Champion Adam Sorokin from La Crescenta, Calif., flew to a 5.92, 201.74 (along with a very swift 3.83 eighth-mile number). In Outlaw Pro Modified, Rod Burbage leads the charge at 6.12-236.53. Scoring the $5,000 winner’s prize in the Bracketeer class was John Shaffer from Boise. He stopped Chuck Hawk Jr. from Tucson, Arizona. 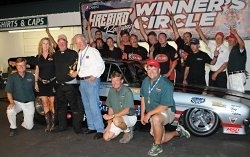 Racing continues on Saturday Firebird with Professional qualifying at 2 pm and again at 7 pm. Adult admission is $24, kids 12 & under are free and admission to the pit area is $6 (pit pass). 1. John Hale, Addison, Texas, 5.89, 236.22. 2. Dan Horan, Sylmar, Calif., 5.90, 246.84. 3. Jason Rupert, Yorba Linda, Calif., 6.03, 229.59. 4. Robert Overholser, Clovis, Calif., 6.05, 234.98. 5. Tim Boychuk, Edmonton, Alta., 6.06, 229.18. 6. Kris Krabill, Tacoma, Wash., 6.28, 197.71. 7. Dennis LaCharite, Torrance, Calif., 6.40, 224.38. 8. Scott Stanger, West Point, Utah (licensing) 6.85, 192.84. 9. Wally Giavia, Klamath Falls, Ore., 7.05,. 122.21. 10. Chris Davis, Spokane, Wash., 7.57, 129.73. 11. Mark Sanders, Maple Valley, Wash., 7.64, 125.08. 12. Cameron Ferre, Huntington Beach, Calif., 8.70, 94.21. 1. Adam Sorokin, La Crescenta, Calif., 5.92, 201.74. 2. Tony Bartone, Long Island, NY, 5.93, 218.92. 3. Brett Harris, Hooper, Utah, 5.99, 239.29. 4. Rick White, San Diego, Calif., 6.04, 246.03. 5. Jim Murphy, Santa Rosa, Calif., 6.19, 212.76. 6. Ron August Jr., 6.42, 194.42. 7. Brenden Murry, San Jose, Calif., 7.90, 119.64. 1. Rod Burbage, Anderson, Calif., 6.12, 236.53. 2. Marc Meadors, Danville, Calif., 6.21, 235.84. 3. John Scialpi, Phelan, Calif., 6.49, 199.82. 4. Craig Cawte, Cranbrook, BC, 6.53, 189.03. 5. Lee Smith, Salem, Ore., 7.26, 157.50. 6. Mike Weiss, Port Orchard, Wash., 9.34, 100.52. 7. Tim Krupa, Valencia, Calif., 9.79, 92.05. 9. Mike Gondziola, Saskatoon, Sask., 12.32, 69.49. 10. Yvonne Lucas, Maple Valley, Wash., DQ. John Shaffer, Boise, .017, 11.19 (9.84 dial) 82.88 def, Chuck Hawk Jr., Tucson, Ariz., -.006 foul, 8.23 (7.92 dial) 130.89. Semi-Andy Schmall, Idaho Falls; Rodney Snider, Grand Junction, Colo.
Quarter-Thomas Bayer, Fontana, Calif.; Mark Sievers, Grand Junction, Colo.; Judy Radford, Baker City, Ore.
Eighth-Tom Clark, Spokane, Wash.; Donny Toia, Tucson, Ariz.; Katie Nelson-Bootsma, Hayden, Ida. ; Tom Koenen, North Bend, Ore.; Rayce Kidd, Twin Falls; Arron Spitzer, Arlington, Wash.; Greg Hicks, Las Vegas, Nev.
Chris Hall, Brigham City, Utah, .032,10.32 (10.28 dial), 122.76 def. Rachelle Nielsen, Rexburg, Ida., .087, 10.09 (10.07 dial), 133.31. Quarter-Matt Comptom, Boise; Don Faldowski, West Point, Utah. Eighth-Doug Wickfors, Eagle; Stan Deming, Nampa; Melissa Jarboe, New Plymouth; Phil Garrison, Flagstaff, Ariz.; Bryan Carmac, Palisade, Colo.
Karl Martin, Riverton, Utah, .112, 11.86 (11.66 dial), 100.53 def. Mike Ritz, Boise,.176, 13.20 (13.00 dial), 106.25. Quarters-Luke Jacobson, Nampa; Paul Sanders, Black Canyon City, Ariz.; Shayne Schaefer, Boise. Rich Pedraza Jr., Boise, .064, 10.06 (9.99 dial), 124.98 def. Jacob Wood, Meridian, –.092 foul, 10.02 (10.03 dial), 124.79. Semi-Michael Watts, Boise; Scott Grondahl, Nampa. David Myhre, Sheridan, Calif., .009, 7.83 (7.82 dial), 164.59 def. Don Anderson, Twin Falls, .045, 9.30 (9.30 dial), 157.56. Semi-Tom Malicki, Brush Prairie, Wash.; Jim Tattersall, Eden, Ida. Quarters-Shane Marsh, Central Point, Ore.; Butch Warner, Surprise, Ariz.; Larry Spitali, Glendale, Ariz.; Nick Nicholson, Vancouver, Wash.
Steve Kelly, Vancouver, Wash., .014, 10.87 (10.86 dial), 119.41 def. Steve Pyburn, Nampa, .055, 9.88 (9.88 dial), 136.77. Semi-Keith Blackwood, Boise; Michael McCallum, Grand Junction, Colo.
Quarters-Ken Frickey, Nampa; Chris Wingert, Lewiston, Ida. ; Tyler Rush, Boise; AJ Armstrong, Star. 1. Jon Bradford, Tucson, Ariz., 7.03, 191.65. 2. Dan Lafferty, Wendell, Id., 7.14, 191.48. 3. Mark Sievers, Grand Junction, Co., 7.17, 178.71. 4. Greg Carlile, Lake Stevens, Wa, 7.19, 190.55. 5. Darryn O’Connor, Fort St John, BC., 7.19, 187.34. 6. Tom Koenen, North Bend, OR., 7.20, 188.83. 7. Kacee Jo Bootsma-Morris, Outlook, Wa., 7.33, 182.62. 8. Dale Green, Covington, Wa., 7.37, 183.22. 9. Cody Hiatt, Boise, Id., 7.39, 181.74. 10. Ken Nelson, Hayden, Ida., 7.40, 182.37. 11. Tim Wallce Jr, Meridian, Id., 7.43, 181.15. 12. Brett Pruess, Grand Junction., 7.52, 178.81. 1st Alt. Tom Malicki, Brush Prarie, Co., 7.57, 178.92. 2nd Alt. Kevin Rennick, Kent, Wa., 7.57, 178.35. 3rd Alt. Dustin Hentges, Olympia, Wa., 7.62, 178.04. 4th Alt. Shane Thompson, Las Vegas, Nv., 7.65. 175.91. 1. Jake Neibauer, Billings, Mont., 7.48, 183.29. 2. Mark Austin, Garden City, Ida., 7.68, 174.96. 3. Brad Pruess, Grand Junction, Co., 7.90, 170.71. 4. Mike Winston, Orangevale, Ca., 8.17, 158.00. 5. Judy Radford, Baker City, Ore., 8.22, 164.95. 6. Donny Toia, Tucson, Ariz., 8.35, 158.56. 7. Butch Warner, Surprise, Ariz., 8.40, 165.53. 8. Jamie Toews, Dawson Creek, B.C., 8.45, 161.05. 9. Tom Franks, Boise, Ida., 8.45, 157.92. 10. Brad Pattan, Emmett, Ida., 8.50, 162.54. 11. Rodney Snider, Grand Junction, Colo., 8.52, 160.00. 12. Kenneth Covington, Grand Junction, Colo., 8.55, 158.03. 1st Alt. Marcus Steed, Chubbuck, Id., 8.74,155.70. 2nd Alt. Mike Goad, Anacortes, Wa, 8.76, 155.27. 3rd Alt. Dan Doersch, Payette, Id., 8.77, 151.15. 4th Alt. Tony Burton, Lacy, Wa., 8.81, 156.60. Under partly cloudy skies, the opening day of the Pepsi Nightfire Nationals featured a good turnout of racers participating in the first day of the Meridian Automotive & Machine Bracketeer Series. 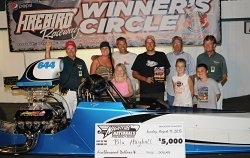 Ryan Cook swept top honors and a cool $5,000 payday. In a double throwdown final, both Cook and Tucson’s Jon Bradford ran dead-perfect on their dial-in, as the eastern Idaho sharp shooter Cook ran 7.95 on a 7.95 and Bradford finished at 7.07 on a 7.07 dial in an all dragster final. In Pro, former Allstar David Chun Jr. collected top honors at 8.62-137.69 when the Chevy II of Paul Nicolosi redlit with a -.012. Both Duston Wurtz and Craig Jensen also reached the Pepsi Winnters Circle, along with Christopher Northup and Melissa Jarboe in Consolation action. Racing resumes on Friday with more Bracketeer action in addition to theopening round of Professional qualifying at 7 pm. 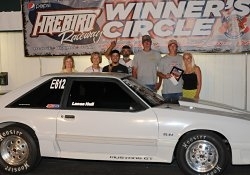 Gates open at 8 am, followed by time trials at 8:30 am and first round of sportsman eliminations at 12:30 pm. Ryan Cook, Idaho Falls, .011, 7.95 (7.95 dial) 164.53 def. Jon Bradford, Tucson, Ariz., .049, 7.07 (7.07 dial) 190.51. Semi-Chris Jaggers, Middleton; Ed Cutler, Meridian. Quarter-Dustin Hentges, Olympia, WA; Mark Campbell, Olympia, WA; Troy Pecht, Caldwell. Eighth-Jim Climer, Kimberly; Darryn O’Connor, Fort St. John, Alberta; Garrett Quinlan, Nampa; Jamie Toews, Dawson Creek, British Columbia; Garnet Rose, St. Albert, Alberta; Ken Nelson, Hayden, ID, John Shaffer, Boise. David Chun Jr., Vancouver, Wash., .062, 8.62 (8.51 dial) 137.69 def. Paul Nicolosi, Nampa, -.012 foul, 10.91 (10.81 dial) 113.00. Quarter- Jeffrey Langan, Boise; Mark Kidd, Twin Falls. Eighth-Troy Pecht, Caldwell, Ida. ; Rayce Kidd, Twin Falls; Phil Sielaff, Pine, Ida. ; Jim Dillon, Nampa. Duston Wurtz, Meridian, .033, 11.94 (11.87 dial) 100.52 def. Luke Jacobson, Nampa, .065, 12.85 (12.80 dial) 104.31. Quarter-Brent Borchers, Meridian; Melanie Higgins, Boise. Craig Jensen, Chubbuck, Ida., .083, 9.67 (9.65 dial) 125.43 def. Liz Micheletty, Kuna, .033, 10.21 (10.06 dial) 131.04. Semi-Gerard Stanberry, Boise; Scott Grondahl, Nampa. Quarter-J.R. Cox, Weiser; Zak Pedraza, Boise; Michael Watts, Boise. Christopher Northup, Boise, Ida., .020, 8.68 (8.64 dial) 147.46 def. Brian Birky, Missoula, Mont., .050, 10.93 (10.90 dial) 134.26. Semi-Tom Clark, Spokane, WA; Stan Leerkamp, Olympia, WA. Quarter-Mike Nicholson, Vancouver, Wash.; Barbara Winston, Orangevale, Calif.; Dale Green, Covington, Wash.; David Ficucell, Las Vegas, Nev.
Melissa Jarboe, New Plymouth, Ida., .020, 9.47 (9.46 dial) 134.85 def. Stan Deming, Nampa, .072, 10.66 (10.61 dial) 114.05. Semi-Dennis Jorgenson, Nampa; Michael McCallum, Grand Junction, CO.
Quarter-Ken Frickey, Nampa, Ida. ; Matt Kielman, Vancouver, Wash.; Larry Pittenger, Williams, Ariz.; Alan Adams, Sheridan, Ark. 1. Jon Bradford, Tucson, Ariz., 7.10, 190.63. 2. Mark Sievers, Grand Junction, Colo., 7.17, 178.71. 3. Greg Carlile, Lake Stevens, Wash., 7.21, 190.47. 4. Darryn O’Connor, Fort St. John, Alberta, 7.21, 186.14. 5. Tom Koenen, North Bend, Ore., 7.25, 187.26. 6. Kacee Jo Bootsma-Morris, Outlook, Wash., 7.34, 181.19. 7. Cody Hiatt, Boise, Ida., 7.40, 182.48. 8. Tim Wallace, Meridian, Ida., 7.43, 180.39. 9. Dan Lafferty, Wendell, Ida., 7.44, 188.36. 10. Ken Nelson, Hayden, Ida., 7.45, 180.79. 11. Brett Preuss, Grand Junction, Colo., 7.52, 178.81. 12. Tom Malicki, Brush Prairie, Wash., 7.57, 178.92. 2. Mark Austin, Boise, Ida., 7.70, 173.77. 3. Mike Winston, Orangevale, Calif., 8.17, 158.00. 4. Bud Preuss, Grand Junction, Colo., 8.22, 165.38. 5. Judy Radford, Baker City, Ore., 8.26, 164.26. 6. Donny Toia, Tucson, Ariz., 8.36, 157.31. 7. Butch Warner, Surprise, Ariz., 8.45, 161.05. 12. Kenneth Covington, Grand Junction, Colo., 8.71, 153.89. Tim Shaw, Melba Outlaws, .066, 10.17 (10.17 dial) 123.86 def. Mike Osich, Down `n Dirty, .116, 10.08 (10.08 dial) 131.48. Quarter-Joe Witherspoon, Down `n Dirty; John Howsden, Down `n Dirty. Nick Marsala, The Barons, .036, 12.27 (12.28 dial) 108.81 def. Rachel Rush, Kuna Knuckle Draggers, .064, 12.57 (12.60 dial) 10.57. Quarter-Debbie Phillips, Naughty Girls; Rod Mills, The Hustlers; Doug Wikfors, PSI Racing. Stephanie Meimann, Modern Rodders, .000, 14.45 (14.50 dial) 97.51 def. Grant Middleton, PSI Racing, -.013 foul, 17.95 (18.00 dial) 75.94. Quarter-Annette Shumway, Notorious Hot Shots; Pam Zollinger, Naughty Girls; Shannon Dougal, Naughty Girls. Josh Cirelli, Flying Brick, .007, 13.34 (13.19 dial) 98.58 def. Jason Shipp, Flying Brick, .180, 13.17 (13.17 dial) 99.04. 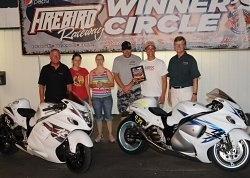 Quarter-Byron Stewart, PSI Racing; Keven Griffin, 3800 Club; Justin Griggs, Kuna Knuckle Draggers. David Whitaker, The A-Team, .012, 15.63 (15.55 dial) 87.03 def. Tim Harris, PSI Racing, .012, 18.64 (18.70 dial) 67.86. Quarter-Lonnie Jesser, Flying Brick; Peter Trunssen, Modern Rodders; Greg Hodges, Mopars Unlimited.